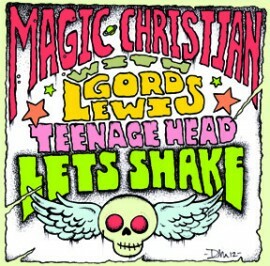 Schizophrenic Records is going back to its roots and is pleased to present MAGIC CHRISTIAN featuring Gord Lewis. The lineage on this 7″ is pure history, in that MAGIC CHRISTIAN are a San Francisco super group featuring FLAMIN’ GROOVIES Cyril Gordon, BLONDIE’S Clem Burke, and PLIMSOULS’ Eddie Munnoz and vocalist Paul Kopft. 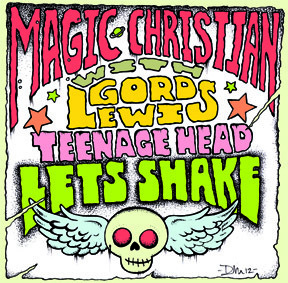 During a fun filled recording session at Hamilton in January 2009, MAGIC CHRISTIAN team up with TEENAGE HEAD’s Gord Lewis and Hamilton scene alumni Dave Rave and Michael Fonfara to record FLAMIN’ GROOVIES’ Teenage Head and TEENAGE HEAD’s Let’s Shake. Cyril and Gord’s distinct guitar sounds respectively shaped generations of music and encouraged thousands of kids to pick up a guitar and rock out! This historic trip down memory lane was produced by Chris Houston.